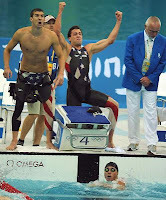 Amazing victory by the US men's 4x100 freestyle relay team with anchor-leg swimmer Jason Lezak overcoming a huge deficit against a quality French opponent for the win. While the NBC coverage was a bit annoying with it's focus on Michael Phelps, it was interesting to hear commentators talk about this as one of the most incredible relays they've seen. The photo above was taken from CNNSI in their "Beijing Games: Day 3" photo wrap-up. Broadcast of the race itself can be found on the NBC Olympics website.